Jimmy is a beautiful mature German Shepherd and Chow mix dog who is in need of a permanent home in Southern Ontario, near Belleville, Trenton, Oshawa area. He has warm eyes, a loving heart and a shy personality. He and his best friend Crosby have been together now for many years, and due to work changes, they are spending more and more time in kennels rather than at home with their owners. Work means extended travel and being away for 2 or 3 months at a time. This isn’t fair to these beautiful dogs who deserve to spend the rest of their years in a home with people who can spend time with them. If you can adopt Jimmy and/or Crosby you would be offering these dogs the good life that they deserve. Jimmy has a quiet personality, he can be a bit stand-offish but is also an affectionate guy. He’s medium-low energy. He likes puzzle toys that involve food as long as they are not too difficult. He likes to play tug-of-war & fetch with a ball or stick but will only play for a short time. He likes to lie on soft surfaces (maybe because of past injuries). He likes the water but doesn’t like to swim. In his youth he had some injuries that make him reluctant to overdo the exercise, but he’s happy to play with his pal Crosby or with his people. This makes Jimmy a great companion dog for somebody with a quiet home, no kids and no other dogs. An owner with a desire to be moderately active with their pet or have space for Jimmy to run and play outdoors. Jimmy would love to be rehomed along with Crosby, (his female pal) as both have been together for many years, and are happy playing together. The pair are 9 and 10 years old and have been together for years. Crosby pulls on her leash, but both love walks in places away from crowds or other dogs. The owners have to travel extensively for work and feel the need to find a safe comfortable home for them both now – as all of the time spent away from them is unfair to these beautiful dogs. They love these dogs, but worry that they are missing out on the family time that they thrive on. Currently, the owners are in Europe and the dogs are with their regular kennel service. They need a permanent home soon as travel demands seem to increase each year. 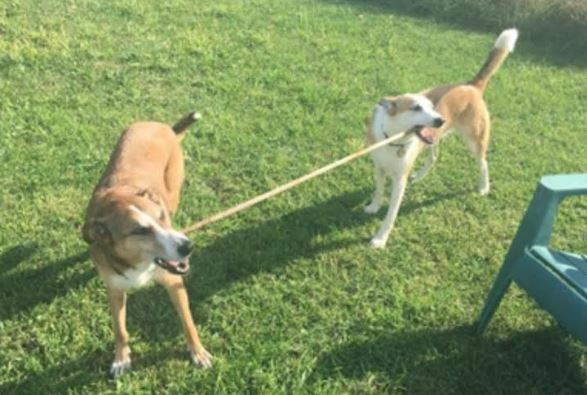 Crosby and Jimmy would be perfect in a home where somebody is always home and there are no children or other dogs. 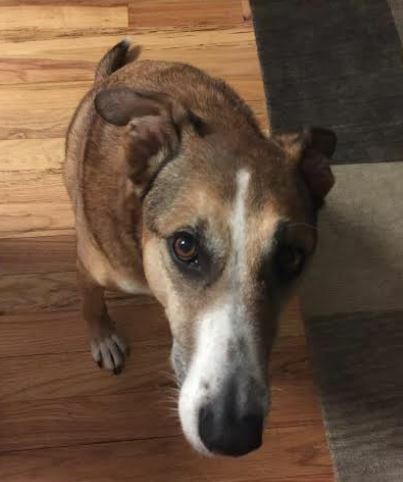 Both are larger dogs and still like a little daily activity, so ideal would be an “empty-nest” situation with a couple that works from home,or is retired. If you are looking to share your days with a dog who will keep you active without wearing you out Jimmy and Crosby would be good for you. Taking both together may actually be easier as the pair get along so well and can lower the stress of fitting in to a new home.Taking Crosby or Jimmy alone will be considered, but for all involved, we’d like to try to keep them in the same home. Any where from the area West of Kingston Ontario, Belleville, Peterbourough, down to Oshawa or even Metro Toronto could be a great fit if you have a good fenced yard and quiet neighborhood.They were city dogs in their youth but love the rural life. The important thing is finding a good home. Questions about Jimmy and or Crosby? Contact our Ontario Dog rehoming team today. Text “Jimmy” to (888) 833-2128 or email Jimmy@Dog-lover.us. We look forward to hearing from you. Jim experienced a spinal embolism about 5 or 6 years ago but recovered well. His back end is not as strong as it should be but he hasn’t been compromised by it. The likelihood of it happening again is close to 0%. Both dogs have lived in a quiet, adult home – they are not used to a lot of excitement. Jim will sometimes try to control excitement by jumping up on people. He can also be wary of men. Crosby was abused by children in her youth & is now afraid of them. Her response is to following them around fearfully in a way that I find worrisome – she is kept away from kids completely. 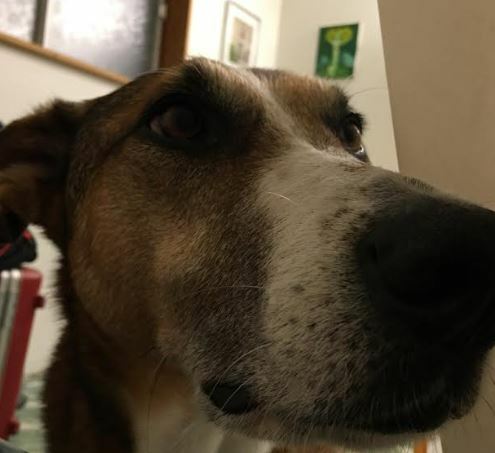 She is also dog aggressive – she will antagonize other dogs (except Jim) but has never been allowed to escalate to a full fight. When new people come around I put them in another room at first until the guest settles in – I’ll let them meet the new person once they are calm. Jim is fine on a leash but Crosby pulls. They were once city dogs but have lived in a rural area for the past 5 years. It would be best to keep them in a rural area where they are much happier. They are fed Acana dog food – same company as Orijen. They get fed twice per day, each from their own bowl. They are fine to eat side by side at the same time. Both dogs like walks around the yard (we have 2 acres) & walks on the beach in the fall & winter when no one else is around. A quieter personality, can be a bit stand-offish but is also an affectionate guy. He’s medium-low energy. He likes puzzle toys that involve food as long as they are not to difficult. He likes to play tug-of-war & fetch with a ball or stick but will only play for a short time. He likes to lie on soft surfaces. He likes the water but doesn’t like to swim. Why is Jimmy Being Rehomed? Our life has changed dramatically in the last few years – our work now involves an increasing amount of travel for months at a time. 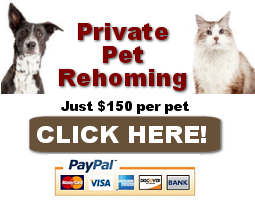 We have looked for other solutions – friends taking them, a pet sitter, etc. We have kenneled them over the past few years but the length of time is increasing from 2 months to 3, now we’re up to 5 – 6 months/year & it’s just not fair for them. They should be in a stable, consistent home. Jimmy is closely bonded with his best friend, Crosby, a Collie Chow Chow mix. 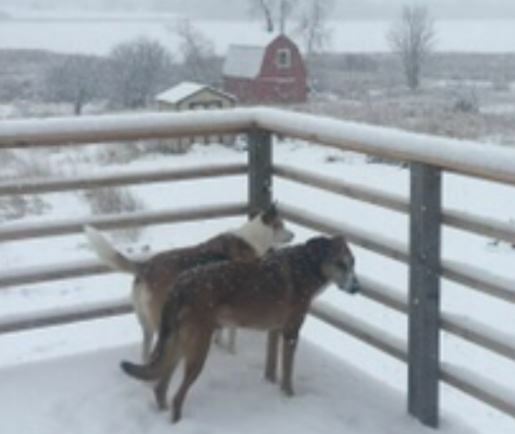 Both dogs are seniors and are looking for a rural home where they can live out their lives in a peaceful setting without children or other pets. They are really nice dogs that deserve a safe, loving forever home together. They are easy to care for and a delight to spend time with. If you are interested in adopting Crosby and Jimmy, please fill out our online meeting request below. Once received and reviewed, our staff will ask the pets owner to reach out to you and arrange a meeting. Adoption fees waived for a very good home.. Some supplies and veterinary records will be included. Questions about Crosby and Jimmy? Contact our German Shepherd Chow Chow Mix Dog rehoming team today. Text “Jimmy” to (888) 833-2128 or email Jimmy@Dog-lover.us. We look forward to hearing from you. Adopt this German Shepherd Chow Chow Mix Dog Near Belleville Ontario today. 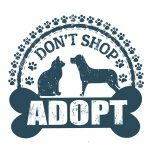 Finding good homes for preloved dogs, cats, puppies and kittens throughout Ontario.